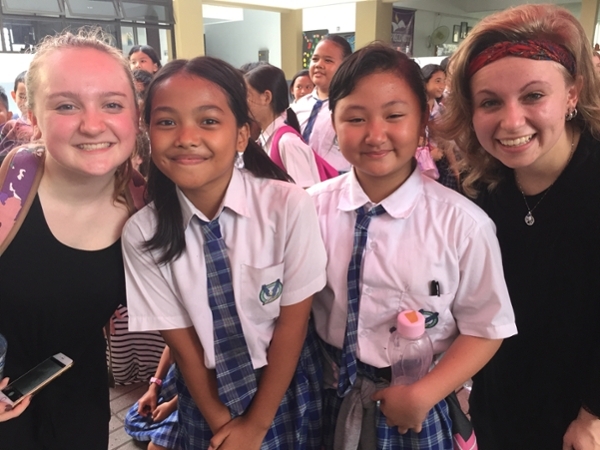 In January 2018, a small group of Theatre, Theatre for Youth and Education students traveled with two advisors to Jakarta, Indonesia to be hosted by the Pelita Harapan Yayasan. This is a network of Christian schools and universities President Andrew Westmoreland and his wife Dr. Jeanna Westmoreland have been associated with for over twenty years. This organization is made up of energetic Christians, who use education and health care to meet the needs of their country. The participants recently gathered at Samford to share their experience and both students and Dr. Jeanna Westmoreland commented on the missional impact of the trip. Westmoreland explained, “This trip began as a cross-cultural academic opportunity but the missional aspect rose to the top through our outreach.” The community embraced the Samford team and in turn, the students found the interaction with Indonesians incredibly rewarding. The performances were so well-received that the schools wanted to initiate drama programs within their curriculum. Outreach is an important component of the theatre for youth program. Students work with local schools and agencies throughout the year providing hands-on experience. From the Emma Taylor Theatre for Youth production that invites area agencies to a FirstNight preview event to helping with the Christmas pageant at Unless U, a local program assisting adults with disabilities, Theatre for Youth students share their talents and demonstrate the power of drama and storytelling.